The What: The Peerless-AV SR555E is a flat panel videoconferencing cart.The What Else: Part of Peerless-AV’s line of SmartMount carts, the SR555E offers an array of features perfect for any setting where telecommunication is required. 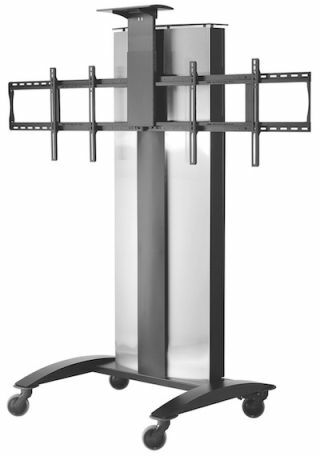 The cart is equipped to support two 40–55-inch displays, providing clear visibility for all viewers. It also features a camera mount, which can be placed above either display, allowing for near-perfect eye contact when used during meetings. The Bottom Line: With the cart’s mobility, the need for multiple video conferencing systems is eliminated, saving overall costs. For security and versatility, the SR555E’s lockable storage area houses all components inside the enclosure and the upper door doubles as a laptop workstation when needed.